I love Christmas – the decorations, the gift giving, the baking. Each year, though, as I see the stores putting out their Christmas wares earlier and earlier, I can’t help but feel a little pang that finding the true meaning of Christmas is lost. My family and I do our best to focus our time and energy on remembering what Christmas is all about. Each year, I try to come up with some new ideas to add in to our old favorites. Is it Santa and all the gifts? No! Christmas is all about the true meaning of Christmas and focusing on all the things that money can’t buy. I love to read the True Meaning of Christmas Poem each year and it is such a good reminder that it certainly is not about the gifts or more stuff but about Jesus. Helping others and spending time with friends and family create wonderful experiences for the entire family. These are some of our most cherished memories. Truly the things that can’t be bought are priceless and will be remembered for many years to come. 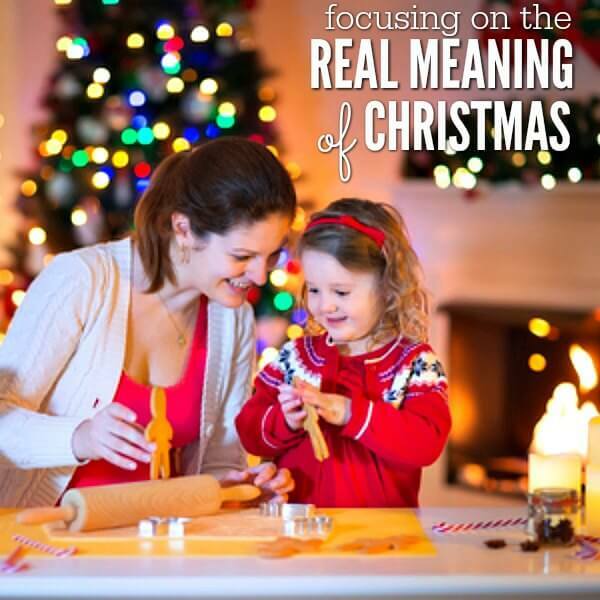 The simple meaning of Christmas can’t be bought or wrapped. Celebrate the birth of Jesus this holiday season by keeping the focus on HIM and not on the gifts and all the chaos of the season. This is the meaning of Christmas in the Bible. 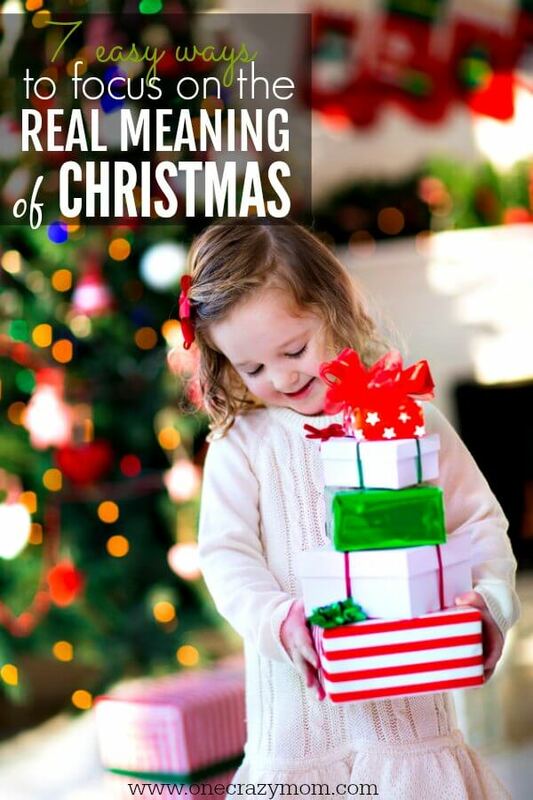 The meaning of the word Christmas even derives from the celebration of Christ’s birth. The sermon on the true meaning of Christmas is a great way to start the season off right. We love to read the Christmas story in Luke 2:1-20. We do this every Christmas Eve and it is a great annual tradition. If your children are asking what is the real meaning of Christmas, these verses will help keep the focus on the true meaning. Christmas is the celebration of the birth of Jesus Christ which is the real meaning of Christmas. This time of year it is easy to lose focus but truly Christmas is all about being able to celebrate the birth of God’s only son. Jesus, the son God, was born of a virgin. Share the Christmas story with family and friends so they can learn that God sent his only son so that we might have eternal life. John 3:16 is a good verse to also have the kids memorize that talks more about God’s gift. 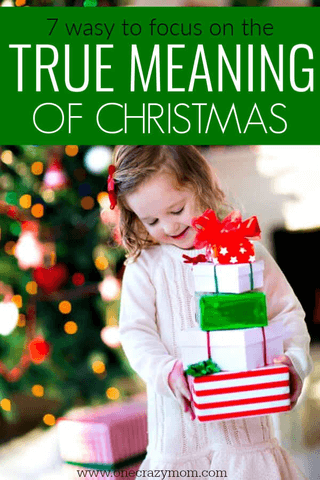 Here are some ways you and your family can remember the true meaning of Christmas this year. With my big family, I know the joy of watching a child open a present on Christmas morning. The thought that there are kids who may not have that opportunity is heartbreaking. Make someone’s Christmas morning by taking the kids to Walmart or Target and picking out some toys to donate. Drop them off together at one of the collection sites (search for your local one here). Go caroling at a senior center. Most everyone loves Christmas music, and there’s nothing quite like watching residents of a skilled nursing facility light up (and join in!) as you sing some of their favorite carols and Christmas hymns. Ask folks from your church, moms’ group, or work to join you – the more the merrier! Whether it’s paying for coffee for the person behind you or telling the person you give your cart to at Aldi to keep their quarter, random acts of kindness are a great way to spread Christmas cheer. Create a friendly competition with your kids to see how many you each can do in a week. Help an elderly neighbor decorate. Offer your help or even just companionship to an elderly neighbor while decorating. Bring Christmas music and hot chocolate or coffee and spend time visiting together. Ask about your neighbor’s favorite Christmas memories. Your soul will be fed as much as theirs! Invite a few of each of your kids’ friends and their moms or dads to join in a baking party. Ask everyone to bring a couple of their favorite recipes along with ingredients. You can supply the staples like butter, eggs, flour, and sugar if you would like to and everyone can make lots of yummy treats. I have tons of fun baking ideas with our 25 days of Christmas cookie exchange ideas. Sit down with your kids and figure out what they’d like to make for family members and friends. We love to make Salt Dough Ornaments and Cinnamon Ornaments for a fun and simple activity for younger kids. Other ideas include custom gifts such as this easy to make DIY Blanket Ladder. Other fun and useful gifts include Homemade Peppermint Scrub that smells amazing! Handmade gifts are very meaningful, and you and your kids get to have quality time together while making them. 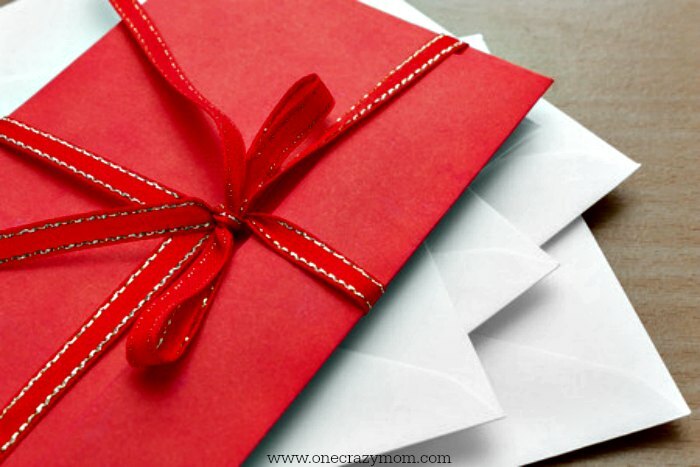 Write holiday cards to military members. While we are able to celebrate the holidays with our loved ones, many military members don’t have that opportunity. You can also find of the other similar programs that exist. With a little bit of effort, you and your family can reconnect and serve others all season long. And if that’s not a great way to get back to the true meaning of Christmas, I don’t know what is!